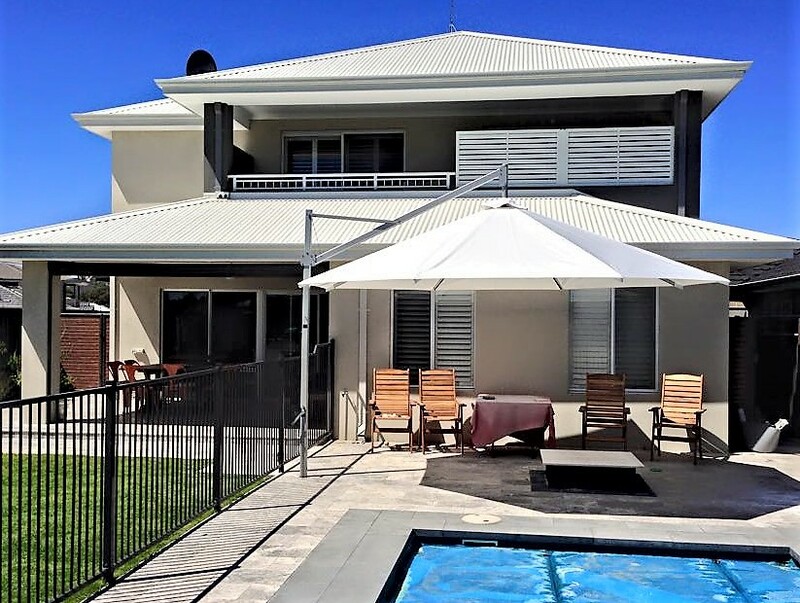 A cantilever umbrella has the support post offset to the side of one edge, allowing an unimpeded space under the canopy. 1. Structural aluminium frame and quality stainless steel fittings. 2. Available in Square or Octagonal Canopies. 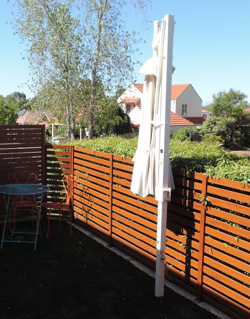 Square umbrellas available in 2.5, 3.0, 3.2 or 3.6 metres. 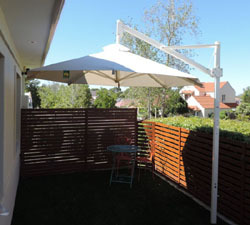 Octagonal umbrellas are available in 2.5, 3.0, 3.6, 4.0, 4.5 or 5.0 metre diameter. 3. Swings 360 degrees for flexible sun tracking throughout the day and can be 'locked off' in any position. 4. 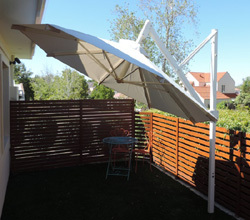 Can be tilted - The umbrella can be tilted to provide additional shade from the morning or afternoon sun. 5. Can be lowered via a built-in winch when not in use. 6. Fabric used in this umbrella is 100% acrylic water resistant fabric. It is dope dyed and resistant to fading and comes in selected colours. Fabric provides ultra-violet protection (ANZS 43991886) and has been mildew and mould treated. The canopy is available with or without a valance. The valance can be either straight or scalloped. A protective cover is included to provide effective protection to the umbrella when closed for the winter months. It is a heavy duty umbrella and must be securely fixed in a permanent position by the installer.